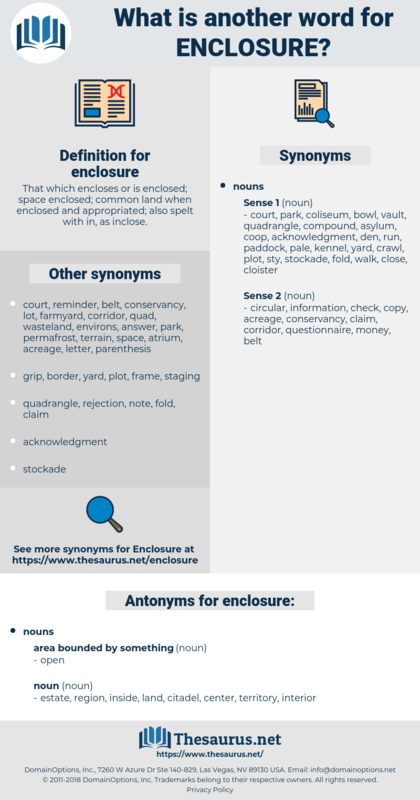 What is another word for enclosure? 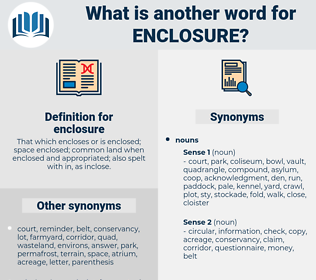 That which encloses or is enclosed; space enclosed; common land when enclosed and appropriated; also spelt with in, as inclose. ministers, recitals, Pens, attachment, attachments, Appendixes, Appendices, Fora. precincts, walls, Boundaries, halls, offices, ministers. attachment, Fairing, envelope, fence, Addenda, appendage, precinct, shroud, perimeter, containment. estate, region, inside, land, citadel, center, territory, interior. Half an hour later we were seated in the king's enclosure, that is, Stephen and I were, for Brother John was already in the royal hut, talking to Bausi. The enclosure was to the point. coop, recess, pit, compound, lock chamber, vivarium, cage, lock, playpen, niche, pound, chamber, echo chamber, storage area, nacelle, pen, hold, cargo hold, dock, dog pound, cargo deck, catchall, cargo area, yard, plenum.